WIN IT WEDNESDAY! 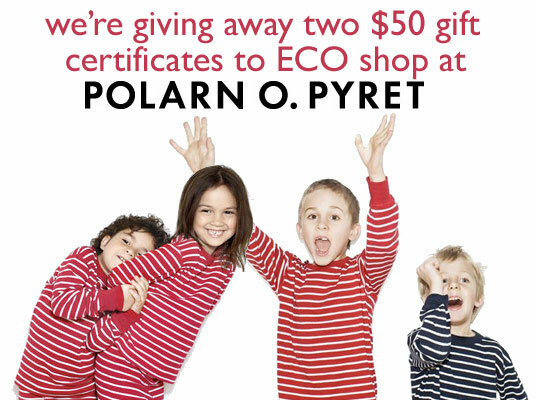 Win 1 of 2 $50 Gift Certificates to Shop Polarn O. Pyret’s ECO Collection for Kids! Let the spring wardrobe shopping begin! This week we’re giving away TWO $50 gift certificates to TWO lucky readers! Winners will get to go on a green shopping spree, selecting clothing from Polarn O. Pyret’s ECO collection! Choose from adorable separates, all made from 100% organic cotton and bearing the Nordic Swan Eco-label. Featuring classic signature bright, bold stripes and eye-catching patterns, there’s something for every green baby or kid in sizes from newborn to age 11. Polarn O. Pyret’s ECO Collection offers many unisex options, making their long-lasting, quality apparel perfect for gender neutral hand me downs. Designed for play, Polarn O. Pyret clothing is meant to be “worn, washed and loved.” The collection ranges from cozy zip-up sleepers to tops, leggings, dresses, briefs and more. Enter to win after the jump… so you can get shopping! ENTER TO WIN A $50 GIFT CERTIFICATE TO SHOP POLARN O. PYRET’S ECO COLLECTION! 1) Sign up for our weekly newsletter (if you haven’t already!) We’ll be notifying the winner in our newsletter – so you need to sign up and receive next week’s newsletter to find out if you have won one of the two $50 Polarn O. Pyret gift certificates! 2) Add a comment to this post with your answer to the following question: Which item from Polarn O. Pyret’s ECO Collection would you like to win for your green baby or kid? Contest ends Sunday, March 21, 2010 at 12 midnight EST. Winner will be announced in next week’s newsletter! I'd have to say the Gulina Axen pajamas! They have the CUTEST print on them! I would love to put my baby girl in that little stripey dress! i love the company philosophy of 'clothing the family'. paired with the classic color palette and timeless stripe motif, this brand is a new favorite of mine ! we're expecting our first [ boy ! ] in early April and I can see him living in the INFANT CLASSIC STRIPE ECO SLEEPING BAG - but those little boxers for when he's bigger are just the cutest thing ! Thanks for the giveaway and for introducing me to this great company ! I would love to win some of the eco underpants for my preschooler. Not only are they cute, keeping the material next to her skin as healthy as possible is important to me. I would get eco dresses. They're bright and happy and hold up beautifully while providing a healthy fabric against my child's skin. We want EVERYTHING from POP! They are our favorite clothes for both our four year old boy and our brand new girl. I'd love the signature stripe eco dress for my daughter (and striped shirts for my boys. After 2 boys we are (unexpectedly) having a girl so the signature eco dress would help fill the gap in our hand-me-downs. We would love to win the blue spring print eco pajamas for 10 month old Charlie. Yes Please PO.P! I would like to win Classic Stripe Leggings Eco, red with white stripes. Lovely!!! My little dude could vertainly use some of those eco print pajamas since his feet are busting out of all the ones he has now! Cool! I'd love to win the striped dress for my little girls or the striped tops for my boys! Awesome clothes!!! Another Classic Stripe Top! These are the softest, most durable shirts ever, and they go with EVERYTHING! I love there sweatpant and the summer school t-shirts. We love the classic stripes from P.O.P! That Khaki Block Stripe Top would look adorable on my little guy. Thanks! ECO PJ's for my little one! Step 1 = done! (I don't know why I hadn't done this before!) Step 2 = LOVE the stripes. I would seriously love everything from this designer. But since I have to pick one, I'll pick the SIGNATURE STRIPE ECO SHIRT (BABY). SO cute! SO versatile! I love PO.P clothes and the Classic Stripe Eco Romper would be super for my little girl! I love the classic stripe Eco top in blue. Wonderful quality and classic design! The fine rib ECO top looks so comfortable! I know my preschooler would love a shirt like that! I would love to have the Gunila Axen Eco Bodysuit! So cute! We love all of the clothes, but I'd especially like to have the boxer shorts - they might just be what it takes to get my 2-year-old potty trained! I would love to get an infant classic stripe Eco sleeping bag. I just love these clothes - my children are wearing hand-me-downs that I wore!! I LOVE the classic helmet, actually didn't think that style existed anymore so I am extra exited to have found it. Thank you Inhabitots! I would love to win the Signature stripe Eco dress for my daughter. I can quickly see it become a favorite for her. It looks perfect for play. I like the FLORAL ECO PAJAMAS. The rain boots are way too cute! I like the limited edition rain boots for boys. The signature stripe eco top for sure. He'd look so cute in it! I am in love with the striped dresses and leggings the wee "E" would look simply stunning in these! Either the colored jeans or some basic t's. This sounds silly - but I'd love some of the girl's briefs for my almost-4 yr. old. All of her underwear now are princessy (cause she got to choose), and are made with the shoddiest material! They're scrachy and fall apart so quickly...makes me uncomfortable just looking at 'm. We would love to see our little guy in a red classic stripe eco romper (biggest size - 1.5-2). I like the kids' Classic Stripe Leggings Eco and the matching top, in navy. They'd be great for sleeping and lounging around in on the weekends. I would love to have the Footie Eco Romper in Lime Green. It's perfect because you can add long sleeves or short sleeves to get more wear out of it. I would also choose the Retro Tennis Top in Baby Blue for my oldest. Thank you!! I'm loving the rain boots! I think our son would have lots of fun sloshing around in puddles and wearing them everywhere. I would pick the boys briefs and the long sleeved blue striped shirt size 6. (Sorry I don't remember the exact name of the shirt now after fighting to log-in/retrieving passwords/etc for 6 minutes.) I like the products on that site though. I have to choose only one? Impossible! Okay...it would have to be a pair of striped eco pyjamas...and stripy diaper wrap to go over his cloth diaper...and...okay, I'll stop there. I like the Stay or Go T. Cute! we need the spring wind fleece jacket for the cool nights we've been having. love this brand! I love the Classic Stripe Eco Body Suit. Thanks for the chance. I have a thing for hot air balloons, so I would probably get the boys' 2-pack underwear in blue/balloons! Since my girls are always stripping their clothes off anyway... I'd love to see them in the classic strip girl briefs with the matching classic stripe hat :) That would be fun and keep them warm, too, right?! i would have to choose the SWEATSHIRT PANTS ECO (CHILD) in mantis. my little green man loves to run and get dirty and these pants would totally hold up so we could pass them down to our next child, making them even 'greener.' and i love that the cuffs roll up...my son gets so upset when his pants get caught on his feet while he's playing and running around barefoot- these pants totally solve that problem. i love the classic style of P.O.P. clothes and the versatility of their unisex design . go stripes! I just love PO.P. But if I were to win something right now I'd want the girl's Gingham Check Dress and the matching boy's shirt for my kids. Both in the fun Mantis color. Signed up for your newsletter and love the waist cuff baby jeans...imagine my newborn wearing this when he arrives in may....sooooocute! I woule love to see my son runny around in the yellow signature stripe t-shirt, classic. I like the boys striped blue boxers and the girls striped red briefs. I love the UPDATED SWEATSHIRT SKIRT , it is cute but looks comfy! I would like to buy my daughter the Smocked Peasant Blouse. I would love to get a pair of these pjs for my daughter, love love love them!!!! WIN IT WEDNESDAY! 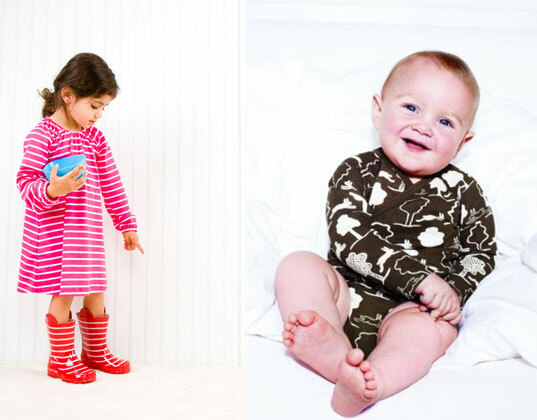 Win 1 of 2 $50 Gift Certificates to Shop Polarn O. Pyret's ECO Collection for Kids! Let the spring wardrobe shopping begin! This week we're giving away TWO $50 gift certificates to TWO lucky readers! Winners will get to go on a green shopping spree, selecting clothing from Polarn O. Pyret's ECO collection! Choose from adorable separates, all made from 100% organic cotton and bearing the Nordic Swan Eco-label. Featuring classic signature bright, bold stripes and eye-catching patterns, there's something for every green baby or kid in sizes from newborn to age 11. Polarn O. Pyret's ECO Collection offers many unisex options, making their long-lasting, quality apparel perfect for gender neutral hand me downs. Designed for play, Polarn O. Pyret clothing is meant to be "worn, washed and loved." The collection ranges from cozy zip-up sleepers to tops, leggings, dresses, briefs and more. Enter to win after the jump... so you can get shopping!